The dry root of perennial herbaceous plant Platycodon grandiflorum (Jacq.) A. DC. of family Campanulaceae. Light smell and lightly sweet taste first then bitter. Bitter, pungent, neutral; lung meridian entered. Ventilate lung, dispel phlegm, relieve sore throat, expel pus. This herb is good at opening and dispersing lung qi to ease chest and diaphragm. It is also good at eliminating phlegm and relieving cough. So it is a key herb for treating cough, profuse phlegm and oppression in chest. And it can be used with combinations for cold-phlegm and heat-phlegm. For cough due to wind-cold, it is usually combined with wind-cold-dispelling and lung-ventilating and phlegm-resolving herbs. For instance it is combined with Zi Su and Xing Ren in Xing Su San from Wen Bing Tiao Bian. For cough due to wind-heat invasion of lung, it is combined with wind-dispelling and heat-clearing antitussives. For instance it is combined with Sang Ye, Ju Hua and Xing Ren in Sang Ju Yin from Wen Bing Tiao Bian. For stuffiness and oppression of chest resulted from phlegm obstruction and qi stagnation leading to disorder of lifting and lowering, it is usually combined with Zhi Qiao so as to ascend and descend qi flow as well as regulate qi and ease chest. 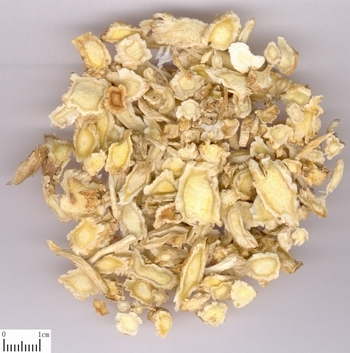 This herb is good at dispersing and opening lung qi to relieve sore throat and regain voice. It is good at treating painful throat and hoarse voice caused by external pathogen contraction, heat-toxin up invasion and yin deficiency with flaring up fire. For painful throat and aphonia due to wind heat invasion of lung, it is usually combined with wind-heat-dispersing and toxicity-relieving and sore-throat-relieving herbs. For instance it is used together with Gan Cao, Bo He and Niu Bang Zi in Jia Wei Gan Jie Tang from Yi Xue Xin Wu. For swollen and painful throat due to exuberant heat-toxin, it is combined with other heat-toxin-clearing and relieving herbs as well as sore-throat-relieving and swelling-resolving herbs such as She Gan, Shan Dou Gen and Ban Lan Gen. For swollen and painful throat due to yin deficiency with effulgent fire and deficiency-fire flaring up, it is combined with heat-clearing, yin-nourishing and fluid-generating herbs such as Sheng Di Huang and Xuan Shen so as to obtain the action of nourishing yin for lowering fire and relieving sore throat. This herb can regulate lung, dispel phlegm and pus. For lung abscess with pyemesis and cough with chest pain, it is combined with phlegm-resolving and toxicity-relieving herbs. For instance it is combined with Gan Cao in Jie Geng Tang from Jin Kui Yao Lue. It is combined with heat-clearing and toxicity-relieving herbs as well as phlegm and pus-dispelling herbs such as Yu Xing Cao and Dong Gua Ren so as to enhance the action of clearing lung and dispelling pus in clinic. Decoct 3~10 g, or make pill and powder. Overdose can cause nausea and vomiting.